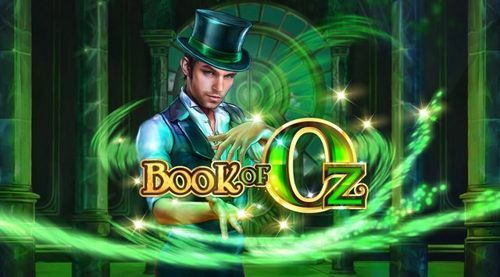 The slots experts are responsible for creating one of the Adventures in Wonderland slot, based on the all too famous novel by Louis Carroll. 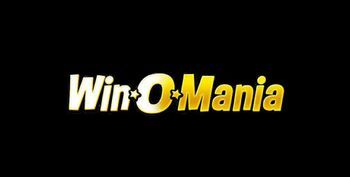 The game features 20 selectable payline that are the backdrop to three rows, five reels and lots of familiar symbols. The most valuable symbol is 10,000 with five Alices of the wild, but this is not the biggest payout. The players will discover a progressive jackpot amount above the reel set, most likely in five digits. Join the Mad Hatter, the caterpillar and the cards soldiers of Adventures in Wonderland slot and play for a chance to win the top-paying 10,000 prize and possibly the Progressive Jackpot. 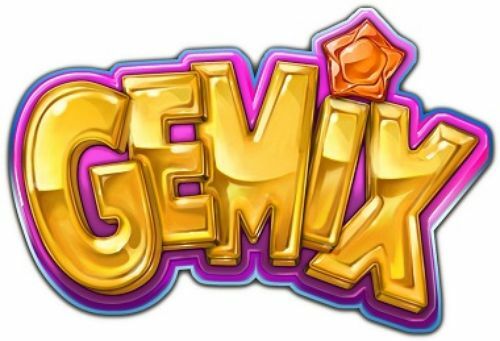 The game offers bonus features, including a free spins bonus. 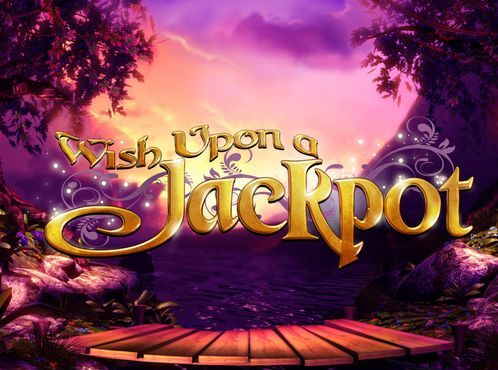 It is fair to say that Alice in Wonderland can have its own genre in the world of online slots. Indeed, there is perhaps a dozen titles that have been inspired by Lewis Carroll's novel and most of these are quite genuine depictions of the story and its characters. As you can expect there are most of the familiar faces and critters that you may know from your general recollection of the storyboard. These are intertwined in-between the three rows and five reels of the game, which has a total of 20 selectable paylines. 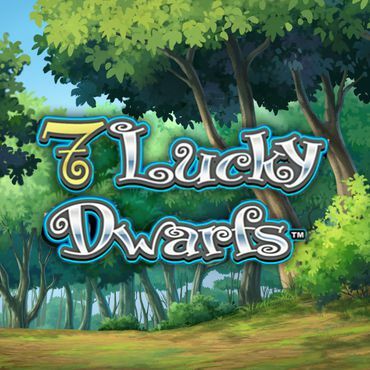 The slots experts at Ash Gaming have done a marvelous job at creating a game that differs from the rest, however. This one has a white layout and most of the symbols are water-color drawn and have an air of brightness in and around them. 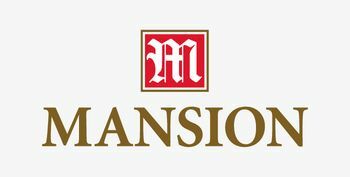 As for the potential winnings, you are looking at a top-paying symbol of an astounding 10,000 and a number of other symbols that are at the thousand-or-more level. 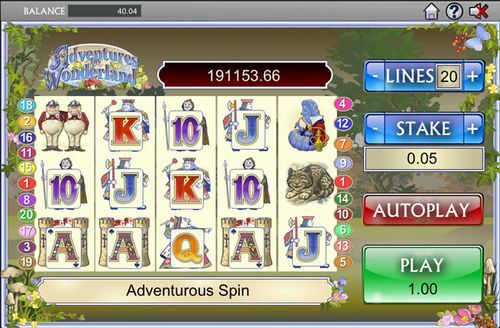 That being said, Adventures In Wonderland slot is a full-stacked bonus feature game with excellent winning potentials, so the first order of business is to find out how to set up the gameplay and give this game a try. In order to shuffle with the card soldiers and the Queen of Hearts herself, you need to set up the amount of the bet, and to do that, finding your way around the controls is where we will start. The two main controls are located in the bottom left of the screen. This is where you will find the Lines and the Total bet settings. The first lets you set up the number of active paylines. Since the top of 20 comes in as default, you can play with the plus and minus buttons in order to bring the number to what you would find preferable. As you are shifting the numbers up and down, you will notice that the size of the bet is changing also. 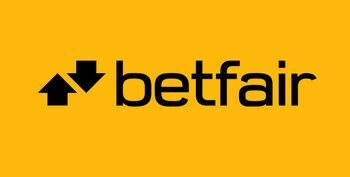 In order to set you preferred bet, you the Total Bet field, where you can select amounts that start with £0.20. 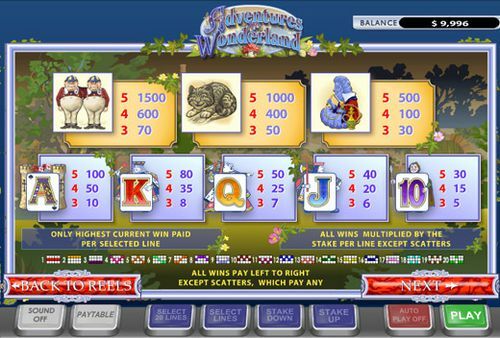 What is very interesting about the Adventures in Wonderland slots is that bringing down the number of paylines affects the total bet. So if you select one line you will play with a penny. Having five lines on will have you play with a wager of £0.05. 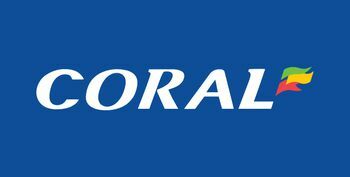 However, if you want to go above the £0.20 for 20 paylines, simply go up with the plus button and you can play with any amount in between a penny and the most expensive wager per spin of £20.00. In that regard, this is a low stakes game. 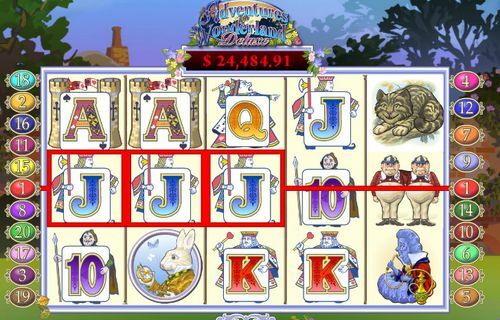 The online slot made by the slots experts at Ash Gaming, which is a company now merged with Playtech, is a full replica of Alice in Wonderland. Naturally, Alice will be found on the reel set in the form of a Wild symbol, which is also the most valuable of all, bringing a whopping 10,000 for a string of five on a payline. The second specialty symbol is the Mad Hatter, who is the game's scatter - that rhyming is a pure coincidence - or is it? - so he is responsible for triggering the Tea Party bonus game. Yet another scatter symbol belongs to the White Rabbit, who is in turn responsible for the free spins bonus feature. 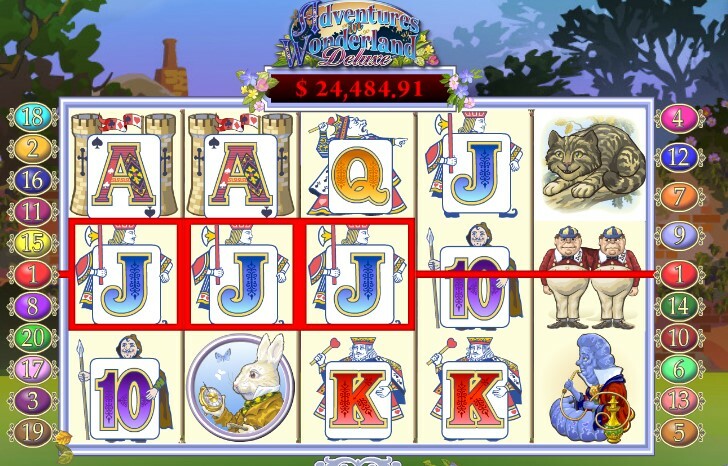 There is another "yet there is another scatter" moment in Adventures In Wonderland slots. That is the Rabbit Hole symbol, which brings about another bonus game. 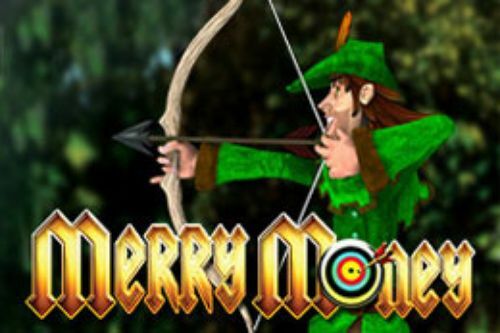 Like we stated, this is one of the rare slot games that has such a highly prized symbol for the Wild. Landing five of the Alice holding a potion that says "drink me" will bring a prize of 10,000 in your account. Then there are few other symbols that pay 1000 or more. The Mad Hatter scatter symbol does that, as does the symbol of the Tweedledee and Tweedledum twins, prized at 1500. Cheshire cat pays 1000 for a line of five matching symbols, but these are not the only symbols that can bring about a surprising amount for a winning. Landing any one of the three bonus symbols will trigger a bonus game. The Tea Party bonus has you picking the guests for which the Hatter pours his brew. The bonus prizes are multipliers which give a kicker to the triggering bet. 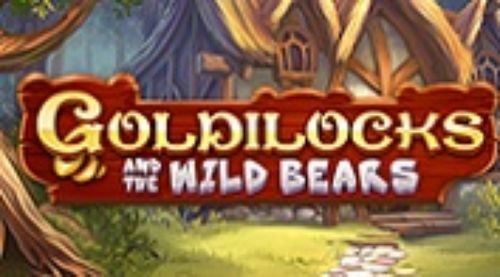 The Pocket Watch bonus will have the hand of the clock spinning to provide free spins as well as sticky wilds, which will endure for the entire bonus game. Then there is the Progressive Jackpot, which is actually the game's top prize. You can win it when the Spoon in the Sugar Bowl appears during the Tea Party bonus, you have landed yourself an immense amount.